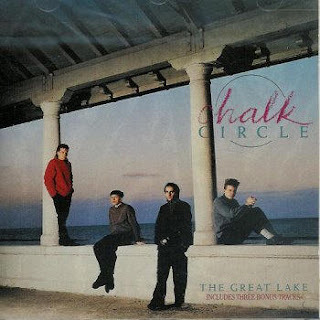 Chalk Circle was a Canadian Post Punk, New Wave, Pop Rock band in the 1980s. The band consisted of lead singer and guitarist Chris Tait, bassist Brad Hopkins, keyboardist Tad Winklarz and drummer Derrick Murphy. Originally formed in Newcastle, Ontario, Hopkins and Tait were paired with Terry Miller and Stani Veselinovic in 1982 as "The Casualties". The band briefly changed its name to "The Reactors" and then to "New Edition" in 1984, and finally settled on the name Chalk Circle (taken from Bertolt Brecht's play The Caucasian Chalk Circle). The band recorded a demo single "The World" (b/w "Black Pit") on cassette and played the Toronto area, subsequently winning the CASBY Award for Most Promising Non-Recording Group in 1985. After signing to Duke Street Records in Toronto, their 1986 debut release was a six-song EP called The Great Lake. Produced by Chris Wardman, it was recorded at Manta Sound in Toronto and Quest Recording Studio in Oshawa. The lead single "April Fool" became a Top 10 single in Canada, along with another single "Me, Myself and I". The band produced videos for both tracks which were regularly featured on MuchMusic, and the EP went on to become Duke Street's biggest seller at that time. Their second release was a full length album entitled Mending Wall released in 1987, with the inspiration for the title coming from Robert Frost's famous poem. Recorded entirely on digital equipment, the crisp sounding album featured another Top 10 Canadian single "This Mourning", a blistering commentary about nuclear politics in the 'ray gun' (Reagan) era of the late 1980s. The album would later be reissued with a cover version of T-Rex's "20th Century Boy", which also became a Top 10 Canadian single. The band's final album was 1989's As the Crow Flies, which featured two singles, "Sons and Daughters" and "Together". Citing 'creative differences', the band broke up in 1990, and Tait went on to form the indie band Big Faith. In 2006, Universal Music Group released a Chalk Circle greatest hits compilation as part of its 20th Century Masters series. The release prompted the band to reconvene after 15 years and in February of that year, they began rehearsals at the Cherry Beach rehearsal studios in Toronto in anticipation of possible reunion shows. On June 17, 2006, Chalk Circle played a reunion gig at Lee's Palace in Toronto.